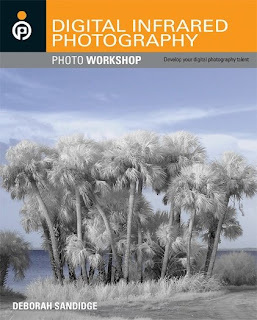 I wanted to let you know about my upcoming book, "Digital Infrared Photography." Published by Wiley, it will be available in June and you can pre-order it now on Amazon. I'm excited to be able to write this book and share with you what I have learned about the surreal world of infrared photography! Digital = no darkroom, no chemicals, no worries, you can experiment as much as you want and fun! We are not limited to what is captured by the camera, we can create traditional infrared film-looking images, or push the boundaries and create one of a kind works of art. If you are considering converting a camera to photograph in infrared, please visit Life Pixel and use the discount code = DEB for free ground shipping.